Figs B1.8; B2.26, 42; C51.1–11. Species recognition. This is the only north eastern Nearctic eumenine species with a somewhat narrowed (but not petiolate) metasomal segment 1 and reflexed, lamellate, apical margins of terga 2 and 3. 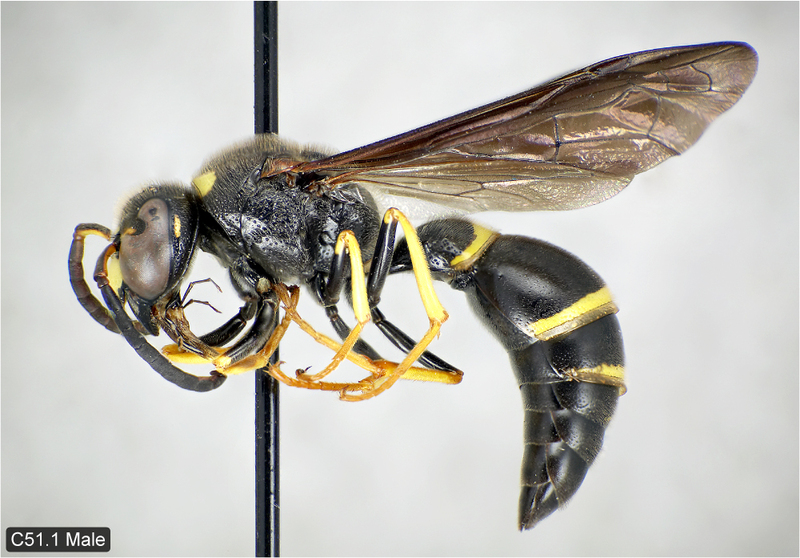 The spiracles of metasomal segment 1 are borne on small but distinct tubercles and the wings are strongly infuscated with a purple tinge. Variation. 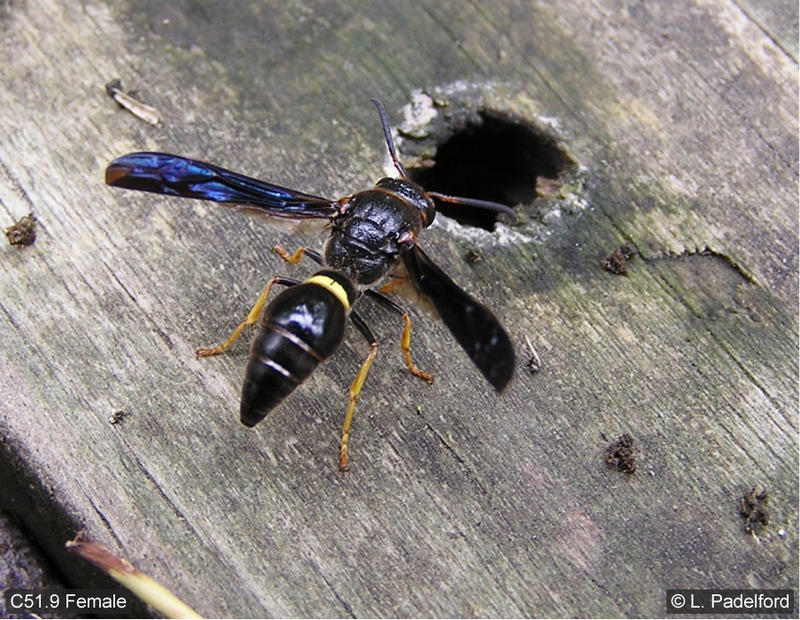 Fore wing length 8–11.5 mm (♂♂), 11–15.5 mm (♀♀). 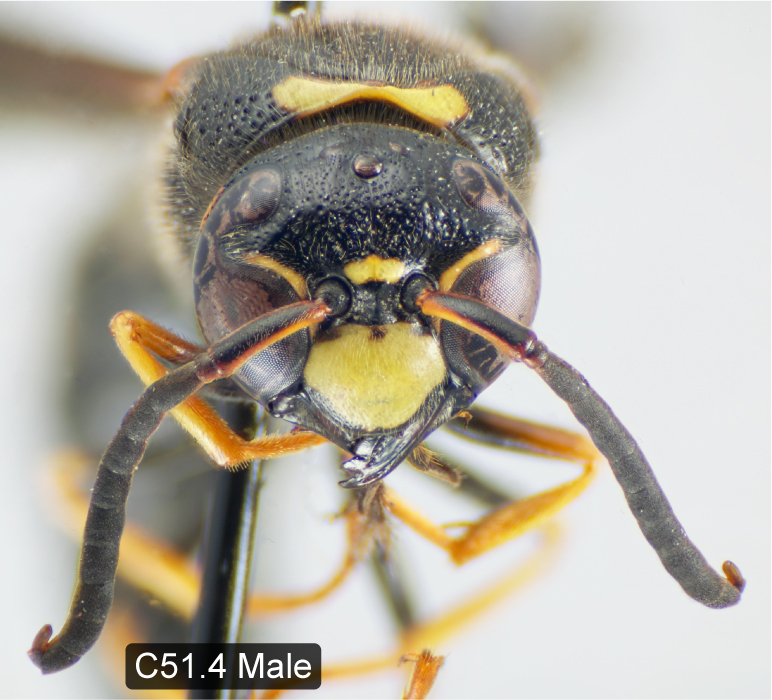 Yellow interantennal spot often absent in female, postocular spot sometimes absent in male. 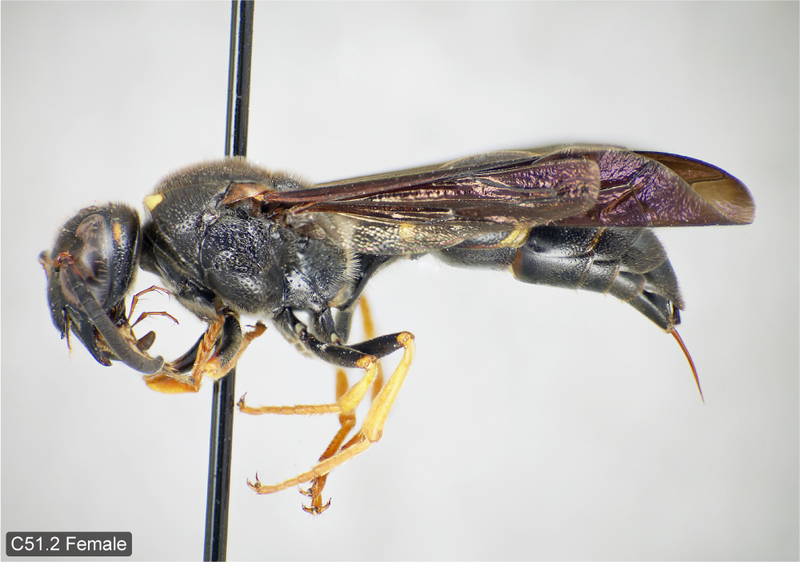 Male clypeus yellow, its apical margin more or less bordered with black, laterally sometimes extending significantly onto clypeal disc, its base sometimes narrowly black and disc with a more or less complete black median stripe. 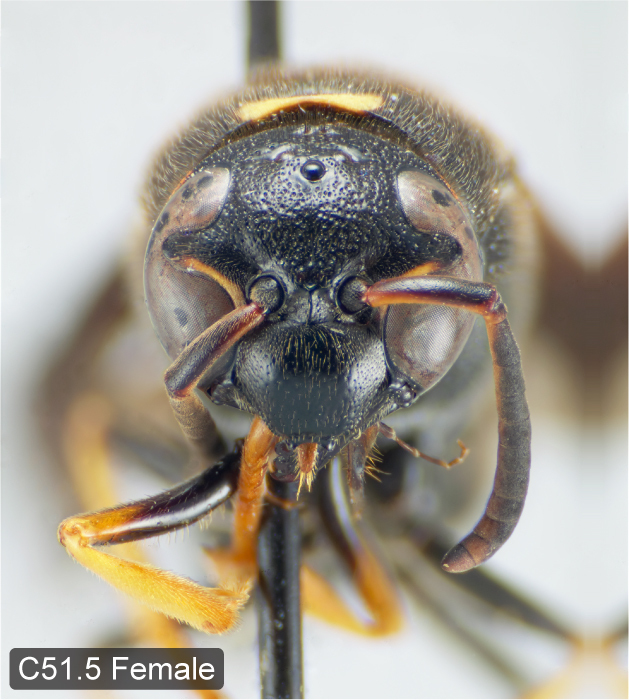 Mandible sometimes marked with yellow and/or amber (more often in male). 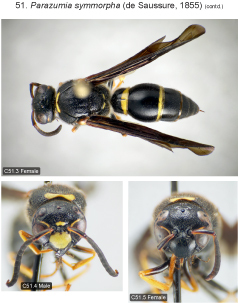 Mesopleuron rarely with yellow dorsal spot (one female). 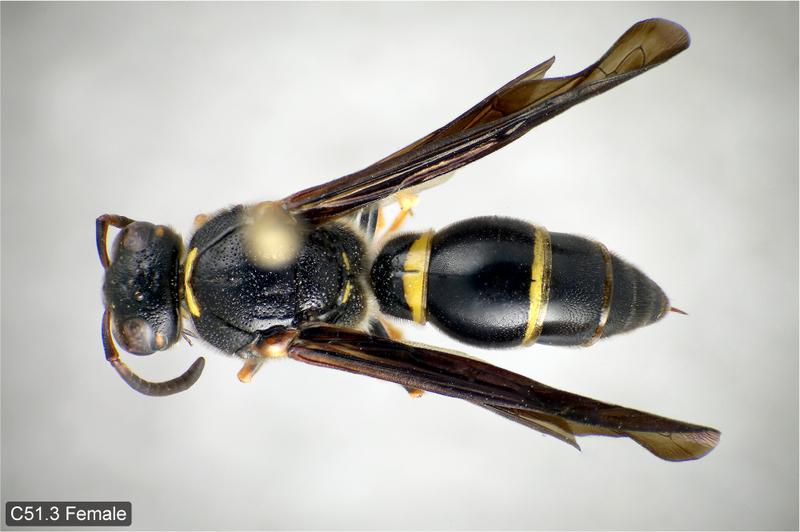 Scutellum sometimes with a pair of small yellow spots, rarely large. Metanotum completely black or more frequently with a pair of small yellow spots, sometimes large, rarely with a complete band. Propodeum rarely with a pair of small yellow ventral spots. Female metasoma black beyond segment 2, rarely with remnants of an apical fascia on tergum 3. Male terga 1, 2 and usually 3 with apical fascia (incomplete on 3), tergum 4 sometimes with a medial remnant of an apical fascia. Distribution. Canada: newly recorded from ON and QC. 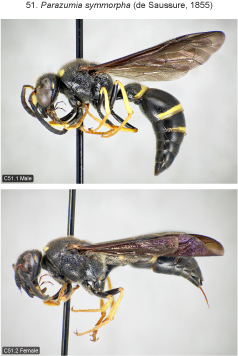 Eastern U.S. west to IA, eastern NE (Cass and Sarpy Cos., new state record, see next paragraph), KS, CO, AZ (Krombein 1979). Biology. Previously unrecorded. 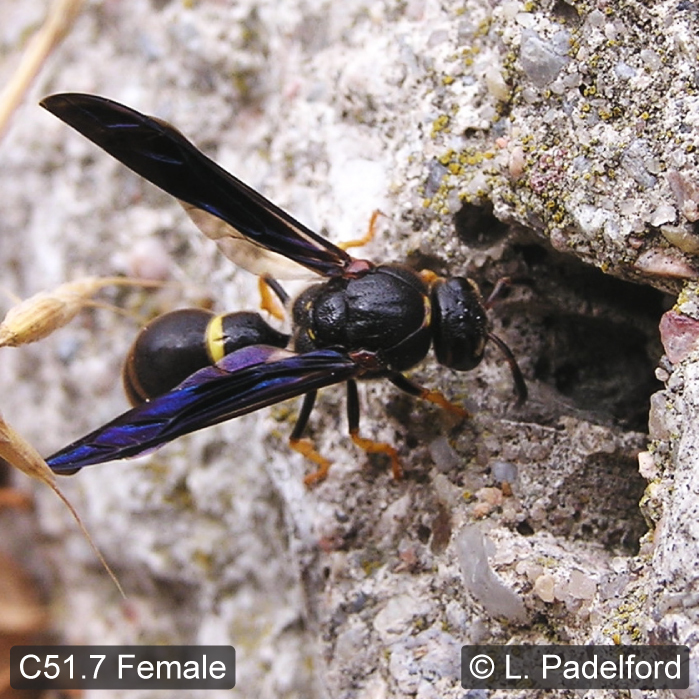 On July 3, 2006, a female of this species was observed by naturalists L. and B. Padelford entering a hole in riprap concrete on the south bank of the Platte River near the Louisville Lakes State Recreation Area in Cass Co., Nebraska (Figs 51.6, 51.7, 51.8; see also Bugguide). In one of the images (Fig. 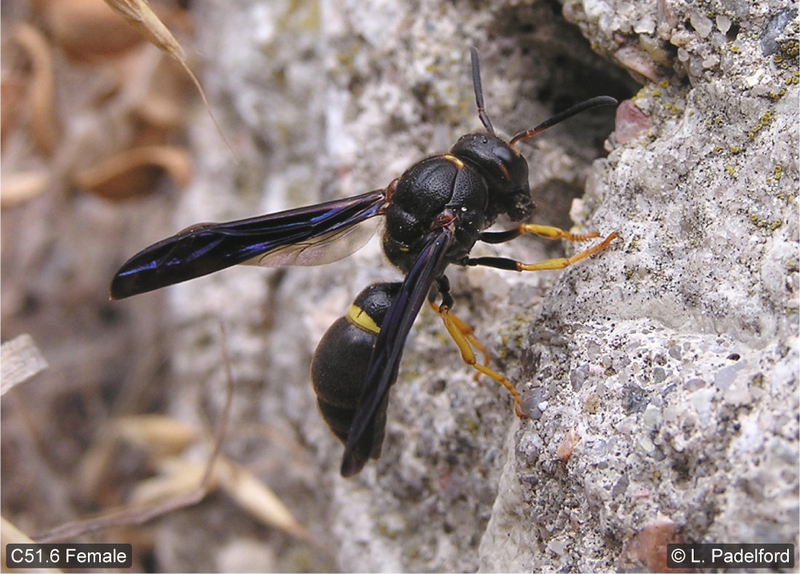 51.6) the wasp can be seen carrying a small spherical mass, apparently a mixture of mud and small pieces of gravel. 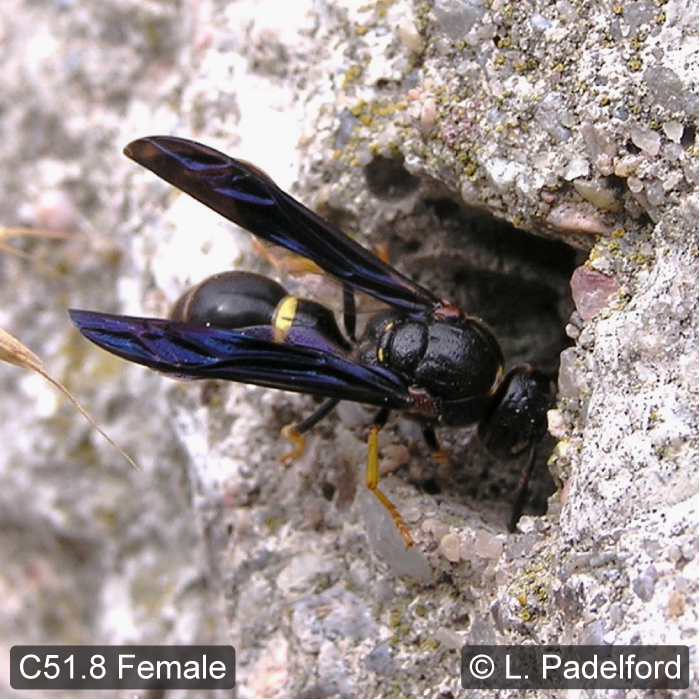 Another female of the same species was observed on July 28–29, 2007 at a hole in the upper surface of a boardwalk in Fontenelle Forest, Sarpy Co., Nebraska by the same observers (Figs 51.9, 51.10, 51.11; see also Bugguide). Its behaviour was described to us as follows (L. and B. Padelford, in litt. 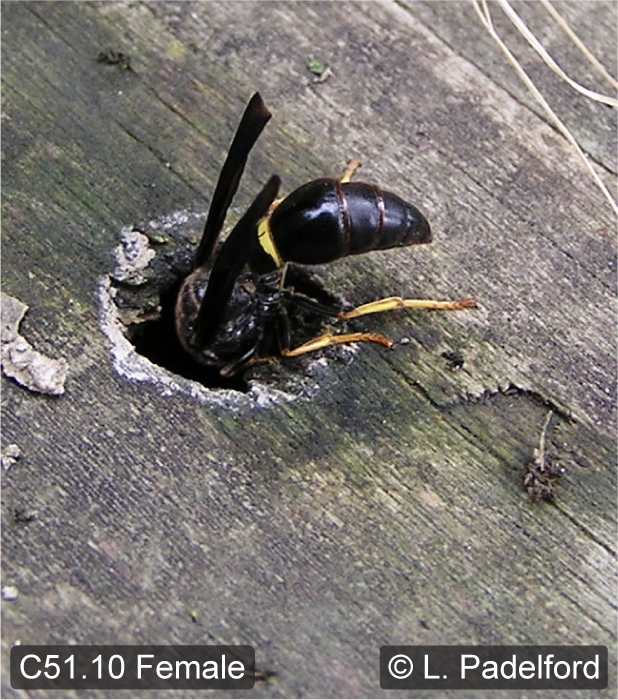 ): “[The wasp] was exhibiting the same behaviour today, i.e., exploring these holes in the boardwalk made by countersunk screws. 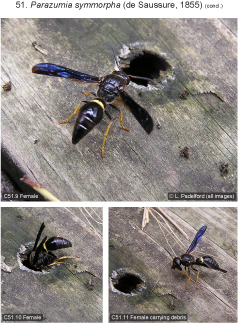 The hole [shown] in the photos seemed to be favored by the wasp because each time it flew it came back to the same hole. The hole was 11 mm in diameter and 14 mm deep. It was entering the hole repeatedly and extracting material that it left around the hole. 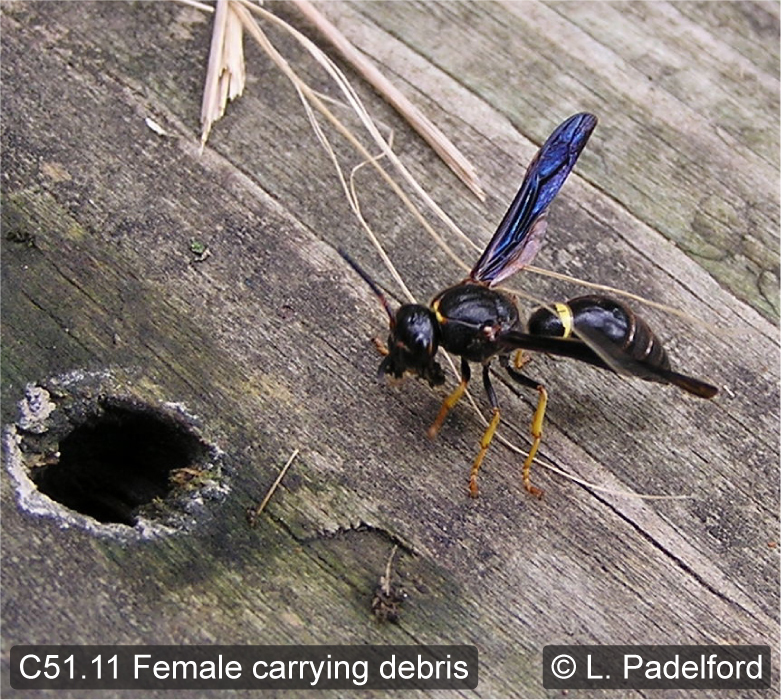 Both photos show some of the debris removed by the wasp.” The behaviour shown on both series of images leaves no doubt that holes in both concrete and lumber were being used as nest sites. 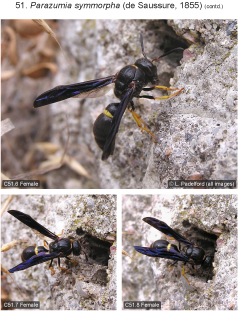 These observations are significant as there is no other published information on the nesting habits of the genus Parazumia.